Art is an essential part of the customer and employee experience at Aalto University Executive Education (Aalto EE). Now the collection of over 200 pieces of art will be complemented with 12 unique handmade ceramic vases designed and produced by six students from Aalto University School of Arts, Design and Architecture (Aalto ARTS). The leading design school in Europe is famous for its design talent and the world class faculty. Aalto University was ranked 13th in the field of Art & Design in the QS World University Ranking in the spring 2017. - As part of our societal impact, we want to celebrate the talent of Aalto University and give exceptional learning experiences for the students. It is also rewarding to be able to give this possibility to the students to show their unique talent during the studies, says Dr. Pekka Mattila, Group Managing Director, Aalto EE and Professor of Practice, Aalto University. 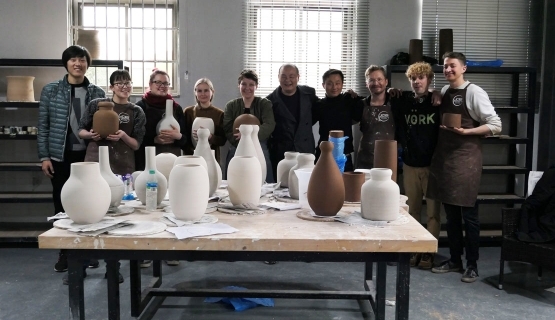 The design students and three teachers specialized in ceramics travelled to Jingdezhen, China, the source and birth place of porcelain manufacturing. During their stay in March 2018 they worked in a ceramic studio provided by the Jingdezhen Ceramic Institute. The works were made on the spot during a three week workshop in the ceramic studio reserved to visiting international artists. The students worked each on their own design, co-operating with local craftsmen: throwers, trimmers, kiln masters as well as porcelain painter. The pieces were fired, packed and shipped to Finland at the end of the stay. Before the trip to China, the students Saija Halko, Nikolo Kerimov, Matias Liimatainen, Maria Punkkinen, Collin Velkoff and Man Yau visited Aalto EE premises and listened to customers wishes as well as the florists views. - We emphasize co-operative projects in studies many times, but of course in this case the trip to Jingdezhen, sort of a pilgrimage place for ceramists, brought the project to another level. Having simultaneously the brief given from Aalto EE gave students a high motivation to their work. High quality artistic approach brought together with functional objects is in the core of design, says lecturer Nathalie Lautenbacher, Department of Design, Aalto ARTS. The final pieces will be presented in an event in Aalto EE premises in Helsinki beginning of June 2018. Physical objects and a documentary film filmed by Priska Falin of the travel and work process will be presented in the vernissage on the 11th of June for the first time. Students have made a travel journal for Aalto Leaders’ Insight. An exhibition will be set up also in Väre, Otaniemi, in September 2018. Aalto University Executive Education Ltd offers thought-provoking leadership development services (Aalto EE), professional development services for specialists and managers (Aalto PRO), and creative solutions covering the whole life cycle of entrepreneurship (Aalto ENT). Aalto University brings to our offering a multidisciplinary approach, together with innovative learning methods; this provides a unique combination of practical expertise with the latest research. Aalto University Executive Education’s strengths lie in its global operating model and diverse offering. In addition to Finland and Singapore, Aalto University Executive Education offers education programs in China, Indonesia, Iran, Poland, Russia, South Korea, Sweden, Taiwan, Vietnam and the Baltic countries. As part of Aalto University, it holds three respected business university accreditations – AACSB, AMBA, and EQUIS – which places it among the top 0.5% of institutions in the world.